ww2dbaseKoichi Shiozawa was the 1st Fleet chief of staff from 30 Oct 1929 to 1 Dec 1930. When the First Battle of Shanghai began on 28 Feb 1932, he was in command of a task force of one cruiser, four destroyers, and two aircraft carriers near Shanghai. He ordered carrier aircraft to drop 30-pound bombs on residential districts of Shanghai, China to pave way for the 3,000 Japanese troops en route; the bombing was the first aircraft carrier action in the Far East. On 1 Feb 1938, he was named the head of the newly formed 5th Fleet, and held that position until 15 Dec 1938. 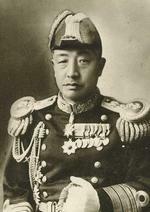 Between 5 Sep 1940 and 10 Sep 1941, he was the commander of the Yokosuka Naval District. In May 1943, he presided over the funeral of Admiral Isoroku Yamamoto, his life long friend. Shiozawa died in Tokyo in Nov 1943 from an acute pancreas ailment. 5 Mar 1881 Koichi Shiozawa was born in Matsumoto, Nagano, Japan. 30 Oct 1929 Koichi Shiozawa was named the chief of staff of the Japanese 1st Fleet. 1 Dec 1930 Koichi Shiozawa stepped down as the chief of staff of the Japanese 1st Fleet. 1 Feb 1938 Koichi Shiozawa was named the commanding officer of the Japanese 5th Fleet. 15 Nov 1939 Koichi Shiozawa was promtoed to the rank of admiral. 5 Sep 1940 Koichi Shiozawa was named the commanding officer of the Yokosuka Naval District, Japan. 10 Sep 1941 Koichi Shiozawa stepped down as the commanding officer of the Yokosuka Naval District, Japan. 17 Nov 1943 Koichi Shiozawa passed away from an acute pancreas ailment.